Cash Back will be awarded when travel is completed. 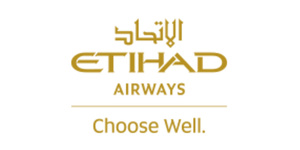 Etihad Airways seeks to reflect the best of Arabian hospitality - cultured, considerate, warm and generous - as well as enhance the prestige of Abu Dhabi as a centre of hospitality between East and West. Their goal is to be a truly 21st century, global airline, challenging and changing the established conventions of airline hospitality.